Congratulations to Kootenay golf pros Bryan Armstrong and Doug Schneider on a great achievement! 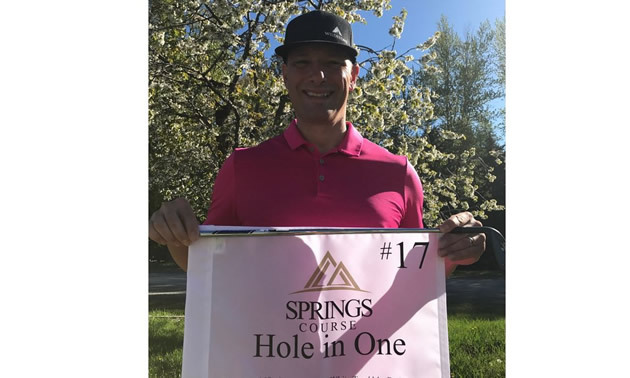 There is nothing like an albatross (3 under par) and hole-in-one to add a little excitement to a Kootenay Pro Series event which was recently held at the Springs Golf Course in Radium Hot Springs. Golf pros Byran Armstrong and Doug Schneider defied the odds by carding an albatross (2 on a par 5) and hole-in-one, while playing in the same group during the same round. The odds of an albatross is said to be 1 to 6,000,000 and the odds of hole-in-one is about 12,000 to 1 for an average player. So Armstrong and Schneider definitely made some golf history with their historic shots at the Springs earlier in May. Come to think about it you might want to invite Bryan and Doug to be part of your next corporate foursome—odds are they'll bring your score down.